This March, CREATURE FEATURES hosts an unprecedented display of many of the original paintings, along with tribute paintings and sculptures from a witch's brew of contemporary artists, including Norman Cabrera, Bob Lizarraga and Mark Tavares, paying tribute to the series. The exhibit will also showcase a display of key props, behind-the-scenes photographs and rare promotional memorabilia, plus a series of live retrospectives featuring screenings of classic episodes with key cast & crew members from the show's original production giving their own personal commentaries. Admission to the opening reception is $10 and includes refreshments. Admission is $5 for the duration of the exhibit, which ends on Sunday, April 1st. 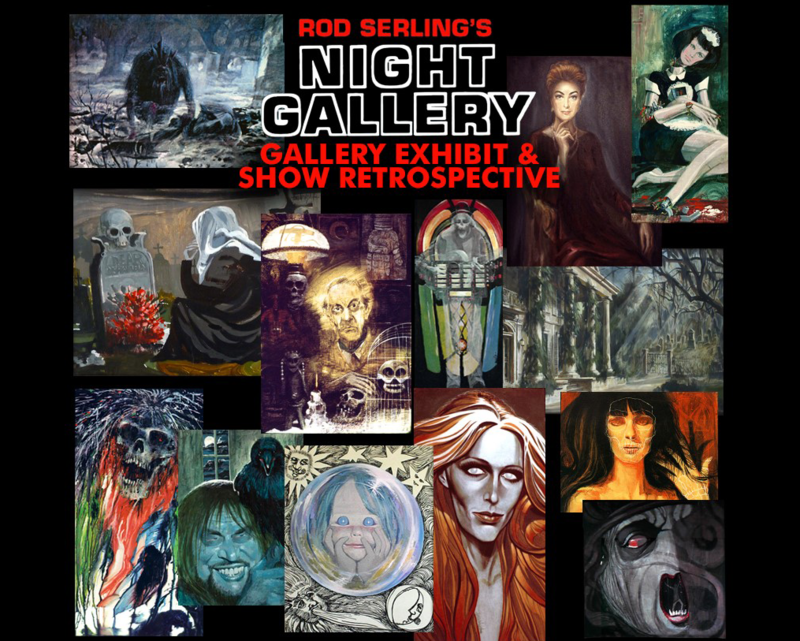 If you or anyone you know was involved with the production of NIGHT GALLERY and would like to participate, or if you have leads on the whereabouts of any original paintings, feel free to contact us at: cfeatures(*at*)gmail.com. Looks like fun! Always loved those painting at the beginning of every story.